Don't eat a sad, soggy sandwich. Make one of these healthy lunch bowls to bring to work. When lunchtime hits, we need something to keep us fueled to tackle the remaining 50 things on our to-do list before the end of the day. (No pressure.) But instead of opting for something healthy and sustaining, we often settle for quick and convenient. In an effort to make more satisfying choices, we're trading in mediocre food for something better, like a homemade lunch bowl. 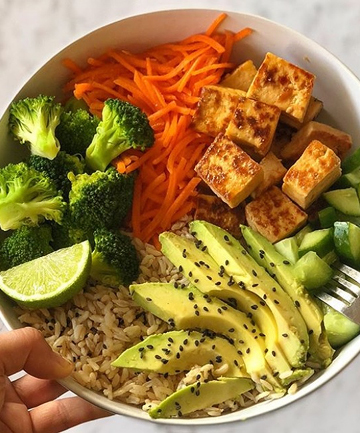 Lunch bowls (aka Buddha bowls or whatever you want to call them) are more delicious, more economical and just as portable as takeout — but way healthier. The bit of time they take to prepare at home is so worth the brain fuel and enjoyment you'll get later. Wise cooks can even use some of their dinner leftovers to create a scrumptious bowl. Read on for 12 satisfying lunch bowls to indulge in during your midday break.